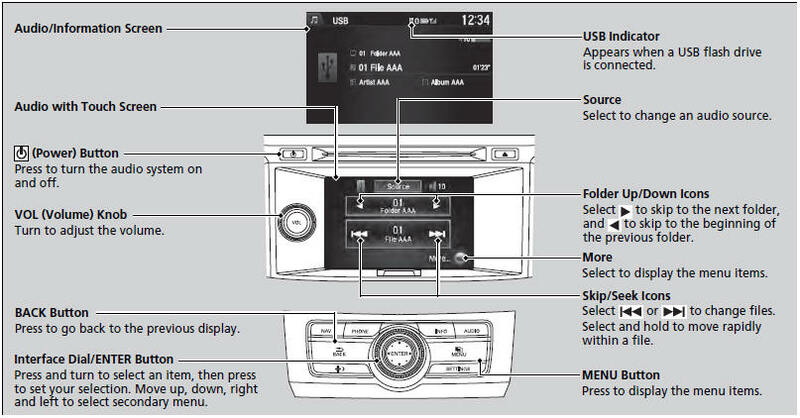 Your audio system reads and plays sound files on a USB flash drive in either MP3, WMA, or AAC*1 format. Connect your USB flash drive to the USB port, then select the USB mode. 3. Rotate , move , then press to select a file from the Music Search list. Files in WMA format protected by digital rights management (DRM) are not played. 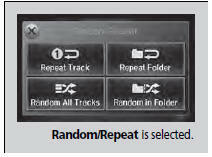 You can select scan, repeat, and random modes when playing a file. 2. Rotate to select Scan or Random/ Repeat, then press . Scan Folders: Provides 10-second sampling of the first file in each of the main folders. Scan Tracks: Provides 10-second sampling of all files in the current folder. Repeat Folder: Repeats all files in the current folder. Repeat Track: Repeats the current file. Random in Folder: Plays all files in the current folder in random order. 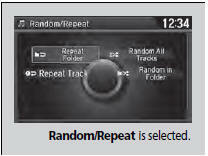 Random All Tracks: Plays all files in random order.